Naija American Girl: Oh Em Gee, it's Emma OhMaGod! Oh Em Gee, it's Emma OhMaGod! 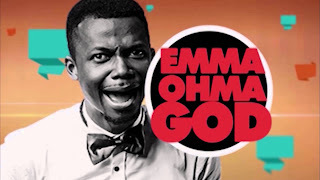 One of my favorite young Naija comedians is Emma OhMaGod. The guy is hilarious, talented, and very handsome too, lol. The first video I saw by him was this one, Naija Babes Mad at Davido. I watch am, laugh tire! He has a ton of these kinds of parody videos, including All of Me by John Legend Owambe Cover, Happy by Pharrell (a follow up to Naija Babes Mad at Davido). Another one of my favorites is Wash Me Nene, a parody of the popular American hip song, Watch me Whip, Watch me Nae Nae. He turns it into an Igbo praise song, and it is quite funny. He also does straight comedy videos like this recent one, which puts a funny spin on the Nigerian fuel crisis. Check out the Emma OhMaGod Youtube page to watch some hilarious videos and subscribe to get notified whenever he posts a new video.